The scrum machine belonging to the UNC Charlotte Men’s and Women’s Rugby clubs has seen its best days. In fact, it’s in such poor condition that the men’s team has not used it this semester, said senior finance major Nathan Zima, treasurer of the national champion Men’s Rugby Club. “It’s almost becoming a safety hazard to use it,” Zima said. But a scrum machine is a necessity for any rugby team, Zima said. That’s why the rugby clubs are conducting a crowdfunding campaign to raise $3,000 to buy a new scrum machine. Teammates push against the padded equipment during practice to build strength, technique and form. Zima said the equipment is an “absolute necessity” for training. Zima said the old scrum machine is “easily 20 years old.” He said the team tried to finance a new one during the summer but did not raise enough money. He hopes the crowdfunding campaign will raise enough money to buy one that the team can use next year. Zima said any extra money raised beyond the cost of the scrum will go toward the club’s operating expenses. The UNC Charlotte Men’s Rugby Club has grown to be a very successful Division II program. 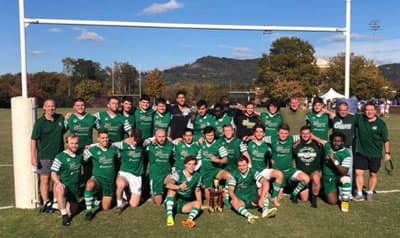 The club, founded in 1989, was the only rugby team in the Carolinas to qualify for the USA Rugby National Championships in both fifteens (15 players playing 40-minute halves) and sevens (seven players playing seven-minute halves) during the 2017 and 2018 seasons. The team finished as the national sevens runner-up in 2017 and the national champions in 2018. The Women’s Rugby Club is nationally ranked in the top eight Women’s Division II collegiate teams for 2017-18. The team has won the conference championship for the last two years and been invited to the regional championships for the past three years. The team is hoping to make it to the nationals this year. Learn more about other fall crowdfunding campaigns.